The screening date was misprinted in the brochure as July 22. The screenings will take place on July 15 to be part of the museum's Family Sunday activities. We apologize for any inconvenience this may cause. 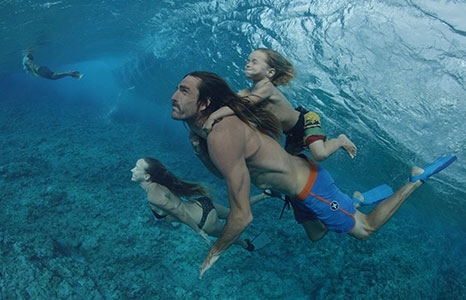 Don't miss this chance to see the Audience Choice: Feature award winner from last year's Honolulu Surf Film Festival! Kaua‘i surfers Aamion and Daize Goodwin (Singlefin: yellow) set off on a year-long global adventure with a toddler and a newborn. Follow their globetrotting in this cinematically stunning film, told through memories of their six-year-old son—Given. They travel through 15 countries in the quest for surf and to fulfill a calling handed down through generations. Set in wave after wave of stunningly visual earthscapes, Given blooms into a tender yet stirring exploration of a young boy’s understanding of life through his familial bonds and their reverence for nature. Deeply moving, Given gives us the humbling contrast of a small voice voyaging through a big world as it finds its way home again.